Artists view of the proposed new Sportsground stadium. A Galway TD has called on the local authority to grant planning permission to the proposed expansion and redevelopment of the Sportsground, and to give the city "another stadium of which it can be proud". This is the request of Independent Galway West TD Noel Grealish, who has made a submission to the Galway City Council in support of planning permission being granted to Connacht Rugby for an expansion of facilities at the Sportsground, College Road. 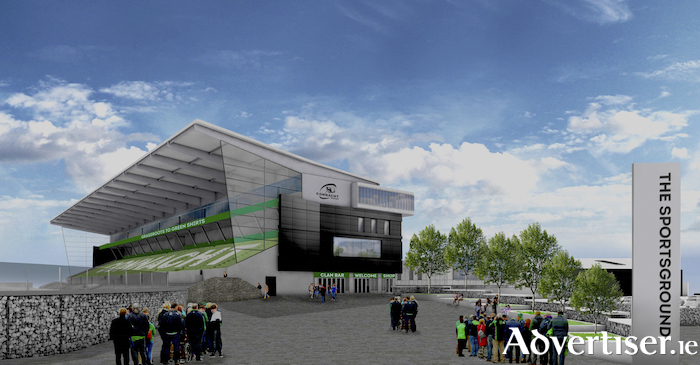 Planning permission is being sought for a €30 million redevelopment of the venue into a 12,000 capacity stadium, with a new stand replacing the existing Clan stand, and a state of the art training centre and other facilities. In his submission, Dep Grealish said the redevelopment of the stadium would be good for Connacht Rugby, and also for the city and county. "Connacht Rugby has become very much part of the fabric of Galway, particularly over the past decade," he said, "with strong local support evidenced by consistently high attendances." According to independent economic research, Connacht Rugby generates around €34.4 million annually to the local economy, through the influx of supporters to the venue, many of them following the visiting teams. Dep Grealish also stressed that Connacht Rugby was "a substantial employer", with more than 130 people employed currently. “The city and region benefits hugely from having such a well-supported entity at its heart," he said. He added that the €30 million on the redevelopment "will provide a shot in the arm for the local construction industry" and allied trades, as well as the hospitality industry locally. Dep Grealish said he believed the proposed increased capacity of the Sportsground "would not impact negatively on local residents", and he added that Connacht Rugby had "engaged extensively" with residents and "would continue to do so". “I am 100 per cent behind this application and am confident the development will receive a substantial contribution towards the €30 million cost from the Government’s Large Scale Sport Infrastructure Fund," he said. “It is only right that Galway city should also give its full support, and I would urge the Galway City Council to grant planning permission and give Galway another stadium of which it can be proud."